Is Your Relationship with Your Boss on the Rocks? Group projects don’t end after high school. As adults, we call it work. Karen grew up, and now she’s a department manager. Like Jerry, some coworkers are undependable. And like Karen, some managers are less than great. It gets even harder to perform well when you suspect your manager might have it out for you. 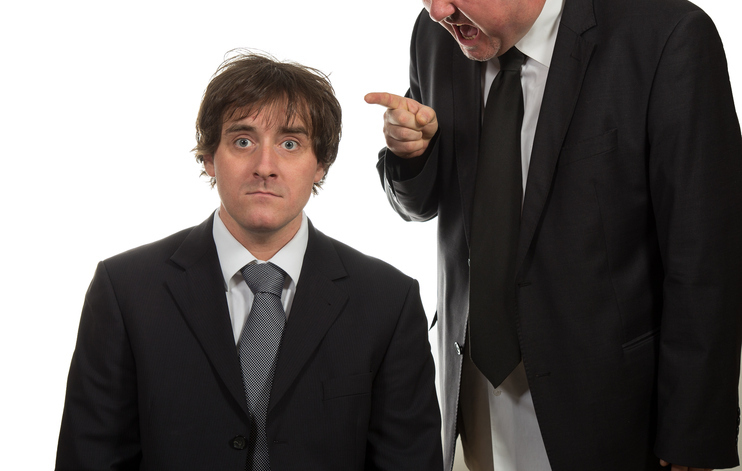 But how can you really know whether your manager has a problem with you? Maybe it’s constantly checking in on you or scheduling private meetings every day. They don’t seem to believe you when you say you have a deadline covered. Whatever it is, they’re not doing it to anybody else on the team. And that’s a problem. You’ll probably never really know the reason. Maybe you made a bad impression on your first day, or the last person to hold the position was a friend of your boss. It could even be something in your background or social history. How do you fix that? By doing a self-analysis. Look at your accomplishments and behavior. Check your career development plan. Are you doing anything offensive or untoward? Did your boss previously approach you about a performance problem you still haven’t dealt with? If you can’t find anything, politely approach your boss about it. Ask them if there’s anything you’re doing wrong. Note specifically how you are being treated differently. If your boss doesn’t make any effort to engage with you, something is wrong. You try to ask for their assistance on a project and they only give yes or no answers. For whatever reason, they don’t want to talk to you. Maybe they don’t find your work satisfactory or don’t see you as worth their time. As soon as you can, engage in a conversation. Don’t let it fester. Ask them why it is they refuse to engage with you. It could be because they expect you to handle your responsibilities on your own, or it could be a personal issue. You won’t know unless you ask. If you’re doing your job well, you can expect to be given more responsibilities. That’s how you move up in your career. However, a boss that has less than friendly feelings for you might be tempted to take credit for your accomplishments. Start to take note of your accomplishments; write down how you achieved or completed projects. Bring this information to your manager, and let them know that you are proud of your work and would like to be recognized for it. If they listen to you and you’re able to work with them, great! However, if your boss refuses to listen to what you have to say, regardless of reason, you may need to go to their manager and let them know about the situation. If the situation still doesn’t improve, it may be time to start looking for a new job with a great boss. Have you ever had trouble with a bad boss? How did you handle the situation? Let us know in the comments below! Next Post Poll: What Part of the Job Interview Process Do You Need Help With? My boss has told my manager that she hates me but I’m not sure why. Was never given a reason or explanation. And when she and I interact you can tell she doesn’t like me. And yes very hard and stressful work environment!! Dealing with a difficult boss can be tough! Here’s a blog we wrote about managing that stress. Hope it helps! My boss did all of the following; impatient, short with response to questions, micro managed, very gruff and negative outward expressions of frustrations (not just to me but most). I received an evaluation email for him, two weeks in. Even though it said that my name would be confidential, I didn’t want to take that chance, so I shelved the email. I then really studied to find positives about his work. This helped me not focus on the negatives. I wrote down the positives and when ready completed the evaluation fairly with positives and how he could improve as a manager (kept personality out of it completely). I don’t know if he knew I gave the evaluation, but it really didn’t matter because the evaluation was constructive. After that things changed, maybe looking for positives change it or maybe I helped him grow. The point is look for the positives and don’t dwell on the negatives. Very helpful! I’ve been in these types of situations not just with bosses but co-workers are even worse. If you’re disliked by one popular one when you’re new to the job, look out they’ll all start to shun you off,, I just played their games and kept on with myself and my duties. Finally opened up to my employer and Bam! They helped me find a new position that I love!! Thank you for leaving this message, Andrew. I am going through the same situation as you were. I thought maybe it was me that was causing something, but come to find out I am just not liked for personal reasons on a co-worker’s point of view. I still haven’t found out why, but I am very stressed out. This helps me look for positive things in my work environment. I love what I do. It is just hard to come to work when you walk in and you could cut the negativity with a knife. It is surprising that there are many people that are in position of supervision but are not fit for it. This person I know creates a lot problems when one under her supervision makes a mistake but this supervisor herself makes mistakes and she acts as she does not, very arrogant, loud, and immature, one day she says do this this way the next day the same thing she says no, do that way, very confusing directions clearly she is in the wrong position! No amount of money is worth dealing with someone who treats you poorly. We spend half of our lives at work….it is necessary that it be a happy environment. Many people view the employee/employer relationship in a helpless manner when it should be a mutually satisfying team. Great point Kim. Thanks for the comment!